On the last morning of our 40th Anniversary Trip north to Prince Edward Island, Canada in June, we leave before our friends Bill and Karen of Fredericton, NB awake. We call it Rothermel-early; it’s just after 4A Eastern Time. 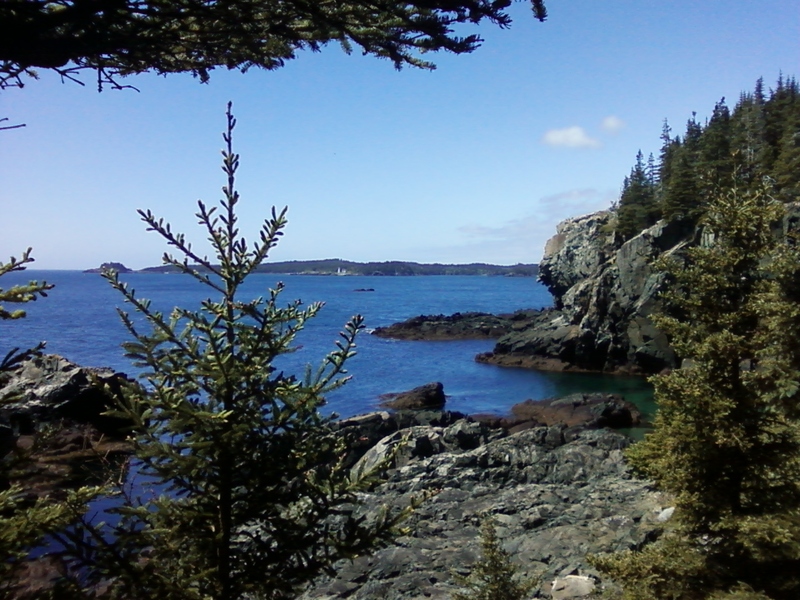 Today we will hike the Fairy Head trail between Calais and Machias, Maine (as far north on the coast of Maine and still in the USA that you can be). 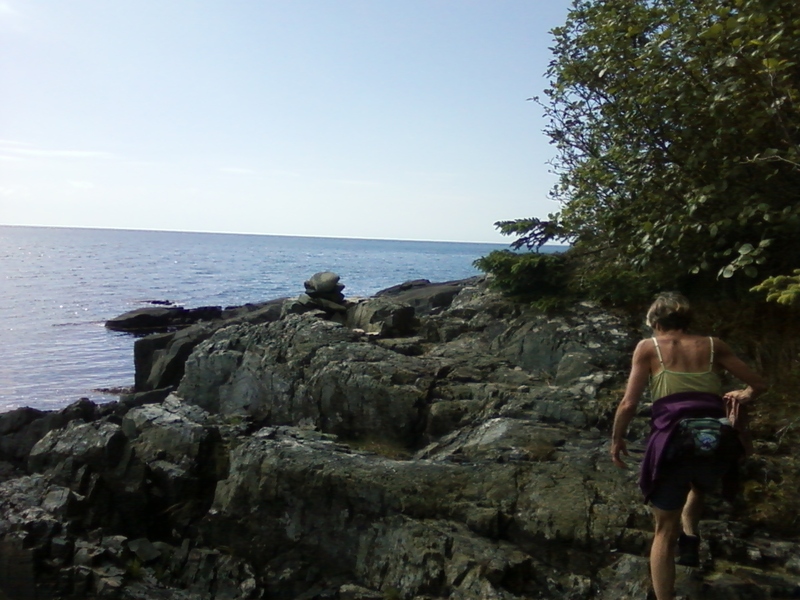 We read about the trail in Yankee Magazine (A Trail for Bold Walkers: Maine’s Bold Coast Trail is off the beaten path. When you find it, you won’t soon forget it. May/June 2012). 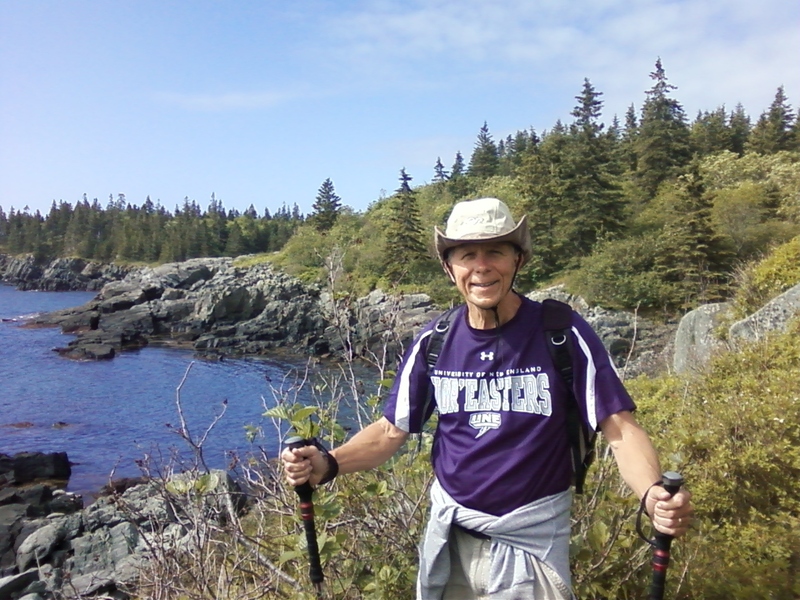 Promised a hike of solitude and spectacular seaside cliffs, we never knew of the Bold Coast despite living in Maine for 30 years. After nearly three hours of driving over mostly back country roads with no traffic to speak of on this mid-June Saturday morning, we soon are on frost heave bumpy Route 191 approaching the parking lot for the Fairy Head trail. Hiking to Fairy Head on the Cutler Coast Public Lands (www.parksandlands.com) is a serious 10 mile challenge for those over and under 60. 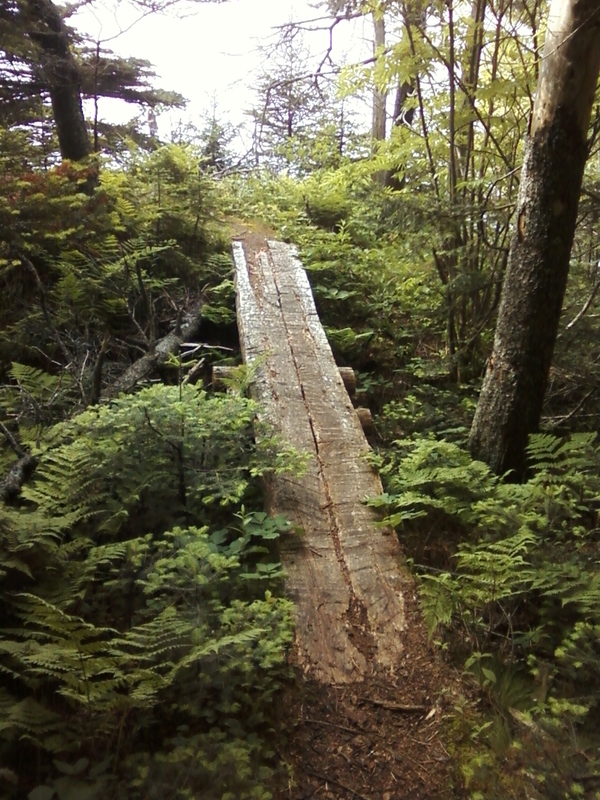 (The land used to be logged by the Hearst Corporation but was given to the State of Maine in 1989.) Depending on the terrain, that’s four to five hours of continuous hiking for us. At the entrance to woodland hike, there are warnings discouraging hikers who are not experienced since these trails are rugged and rocky. 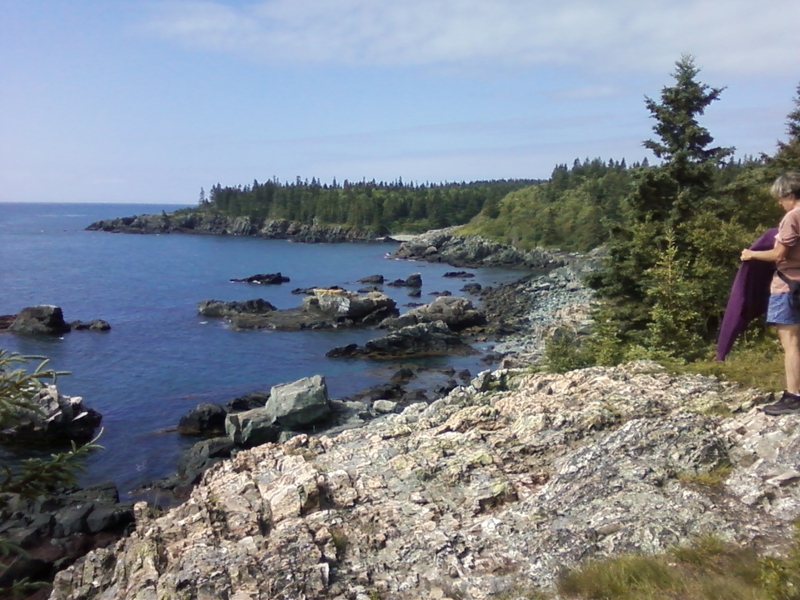 Fortunately, this coastal trail offers three different lengths of hikes. There’s the three mile baby bear hike to and from the coastal headlands; a 5.8 mile mama bear hike that takes hikers along the coast for a few miles and then cuts across this figure eight trail out at the Black Point Cut Off; and finally the papa bear 9.8 miles that takes hikers 3.5 miles along the coast and then back through the inland forest. Today, my mama bear and I tackle the big one. With backpacks filled with water bottles, egg salad Subway subs, rice cakes and gorp, we take to the lonesome trail under cloudy morning skies. Heading for the coast 1.5 miles away on rocky and rooted trails among scraggily pines, we find our foot plants are usually on the uneven, well-marked path; that will take its toll on our knees and spirits near the end of the five hours of hiking we will do. Though the trail is not wet, there are swampy areas and the state park service has laid puncheons wherever the terrain be soggy. Due to the trail’s remoteness, some puncheons are dropped in by helicopter. 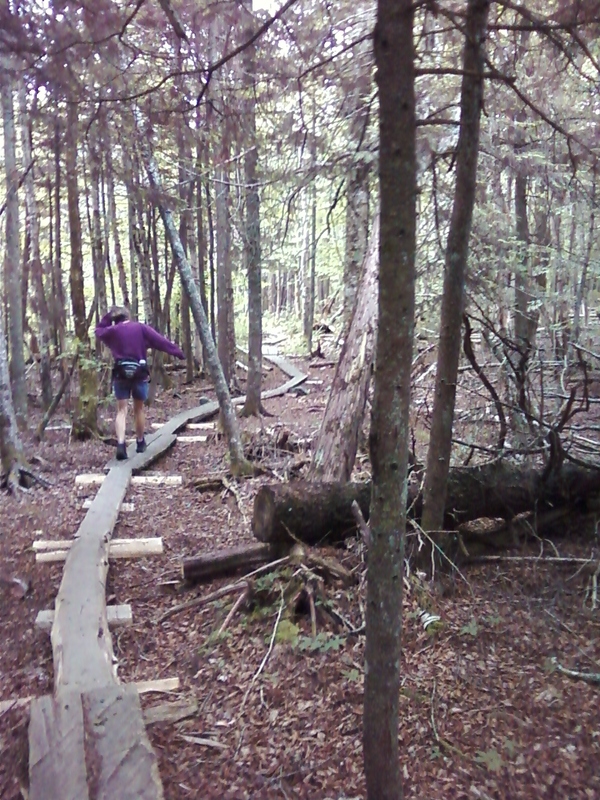 These 10-12 cedar foot planks keep our feet dry and actually make the trail passable at all. In general the hike to the coast is level, but I am thankful for my trekking sticks which brace my knees for the downhills. We cross various blow downs (trees that have fallen across the trail), but the hike to the coast takes just over 30 minutes. We bears are in cruising mode. 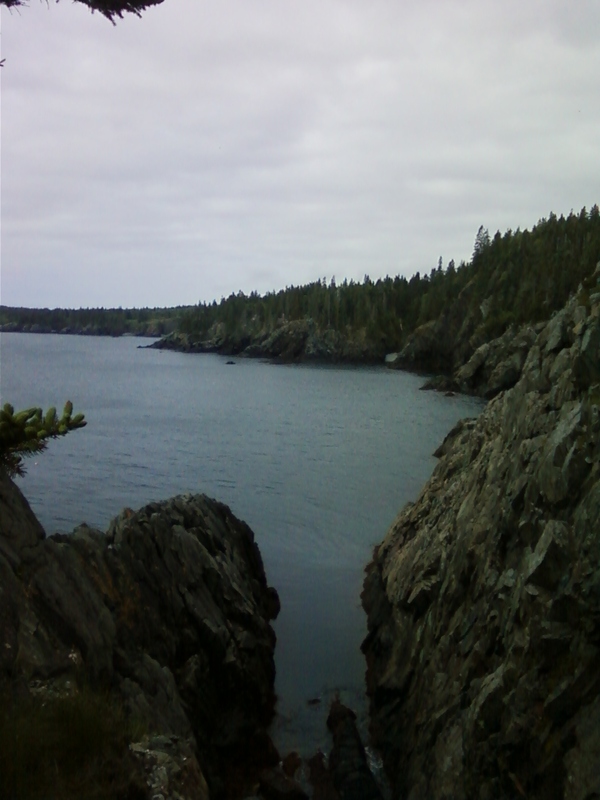 Blown away by the early morning beauty of the cliffs, we take the trail along the rocky cliffs of Down East Maine. Typically Hannah leads, as she did when we danced as college students at the College of Wooster in Ohio in the late 1960s. Her pace is steady and stronger than mine and keeps me moving forward in a purposeful way. We skirt the cliffs but never need to get close enough to feel in danger; there are no protective fences. 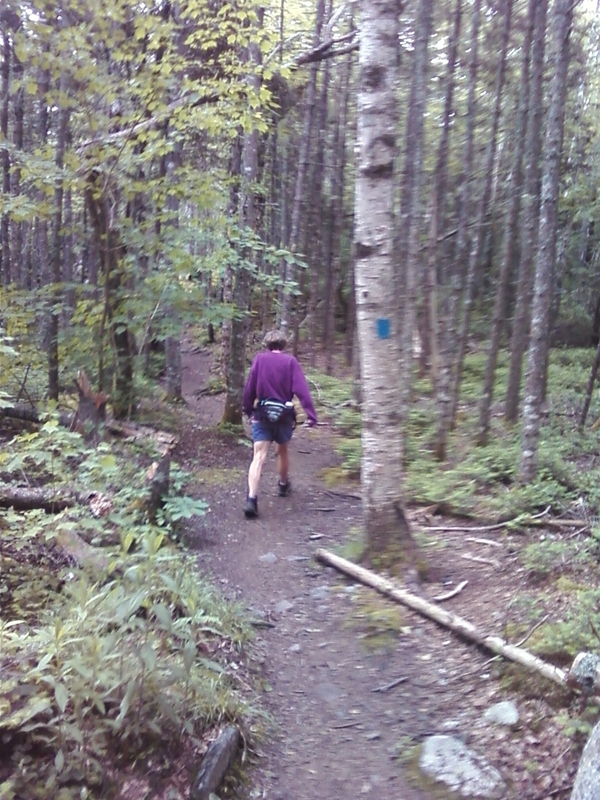 The blue blazes (2”x8” vertical blue marks on trees and rocks) mark the trail really well. Occasionally we go off the trail, but we fear not; one, we know the trail closely parallels the coast and, two, when necessary we double back until we see the last blue blaze. At times we walk through leafy brush where there isn’t even a place for me to plant my trekking sticks. Navigating through blue berry patches, which are 4-6 weeks from being ripe, we do not see a soul. 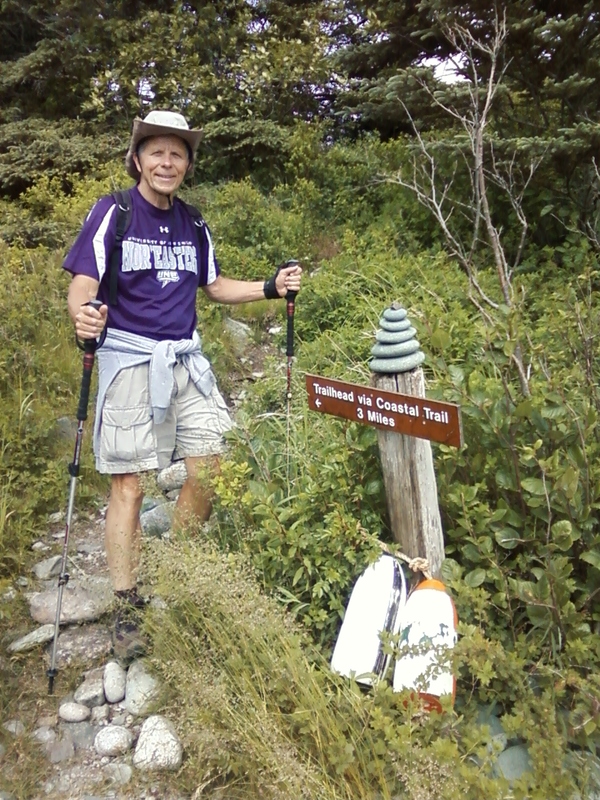 We hit the Black Point cutoff in 90 minutes, having hiked three miles. 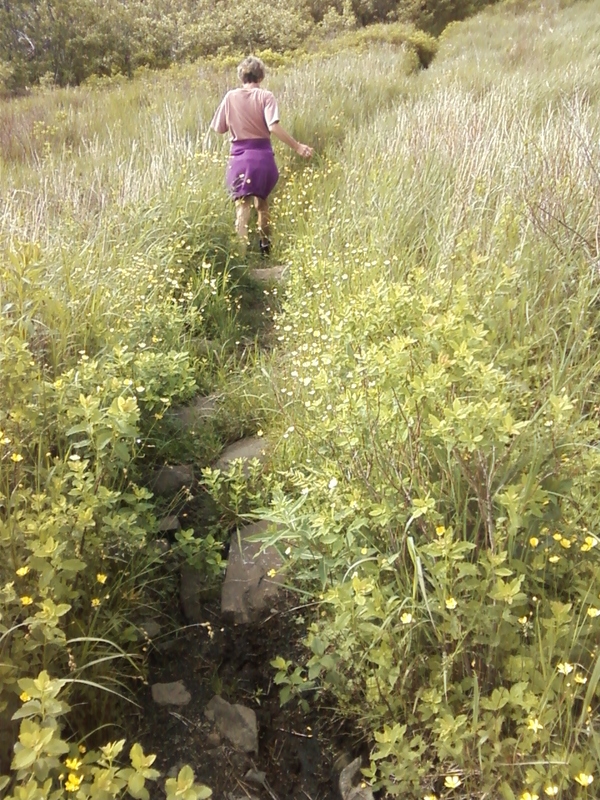 Two miles per hour is a reasonable pace with these coastal ups and downs over these still rocky and rooted trails. Removing our sweatshirts and tying them around our waists, we welcome the morning sun as it breaks through the clouds. Hiking on in the lead, Hannah comments that blue is her favorite color. That is, blue for the blue blazes that guide us along the trail. Two hours into our hike and not having seen a single person, I ask what’s her over/under for seeing one person. She says over (i.e., more than one). I’m not so sure. 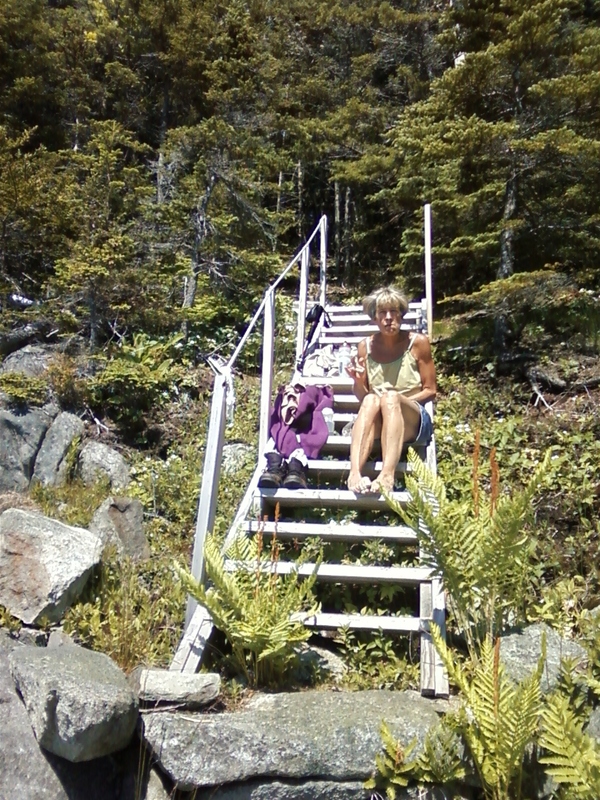 Two and half hours later and nearly at Fairy Head, we spot the wooden stairway to one of the three trail campsites. It’s only 1030A, but it’s lunch time since we did the Rothermel-early thing. 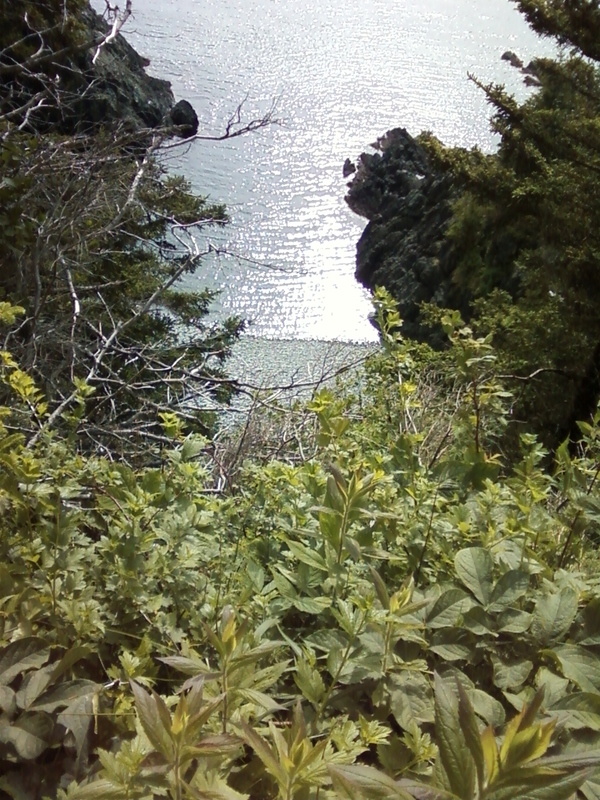 Taking off our hiking boots and double socks, we feast on our egg salad subs while soaking in the ocean view. And then Larry from Oklahoma appears. He’s smiling (must be a Canadian Oklahoman) and mentions he’s off to Lubec, Maine for what is reported to have the finest scallops at the Inn at the Wharf. If all Oklahomans are these welcoming and engaging, I am guessing Oklahoma is a province of Canada. Weary, we arrive at Fairy Head 3+ hours after beginning. Catching a quick glimpse of the light house across the bay, I do the calculations in my head that we’ve some serious hiking back to the trailhead. Though there are occasional mileage markers I use my watch to estimate where we are on the trail. Hiking a mile in thirty minutes, we change places and I take the lead so I can more easily hear Hannah’s quiet voice. Our talking helps the miles pass more quickly. Not much of a solitary hiker, I am fed by conversation with Hannah. At the Black Point Cutoff we take one last break of peanut butter on rice cakes (Do these kids know how to live?). Four plus hours since we started, the inside of my knees are barking. With five hours of hiking assured, we are banging up against the limits of our endurance. With nothing else to do but keep moving on, we keep moving on. There’s no bus coming for us. Lucky it’s been mid-60s today when summer 80s could have had us sweating bullets and being a banquet for mosquitoes; only when we stop do the mosquitos claim another two victims. Arriving at the parking area 5+ hours later, ten cars fill the lot; we are trail weary and spent after five hours hiking. 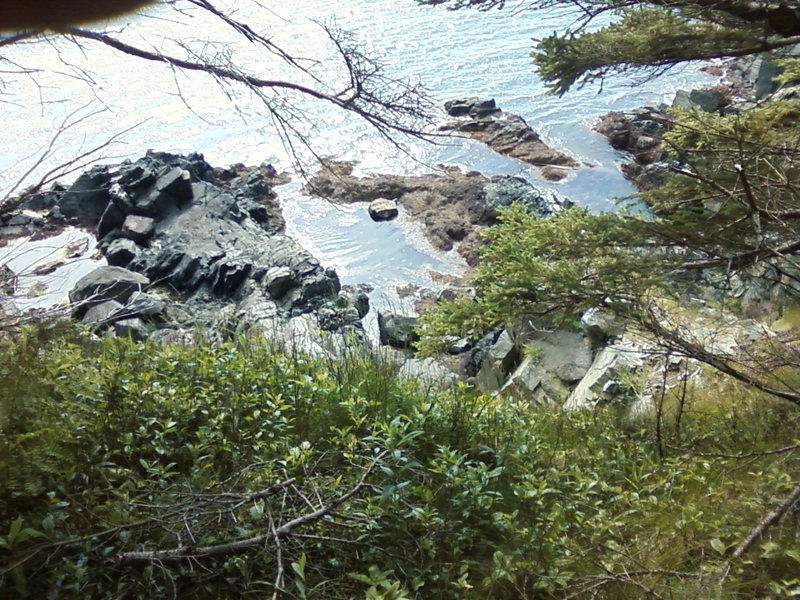 This out-of-the-way hike, maybe 4.5 hours of driving from our home in York, Maine, is a state of Maine jewel. 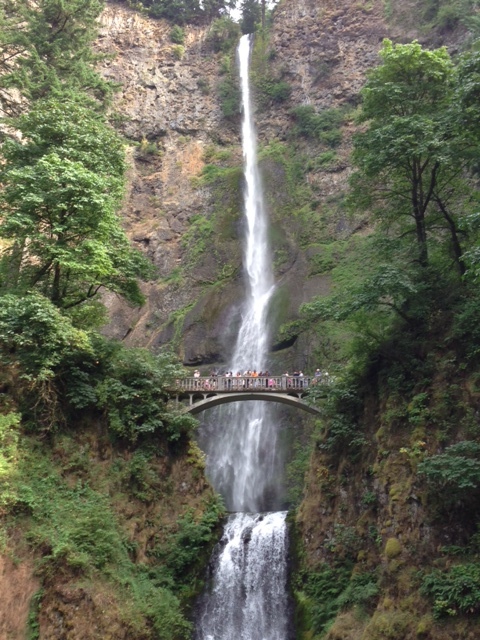 As always when hiking, be ye olde or be ye younge, know thyself, thy limits, and the conditions. Be prepared. 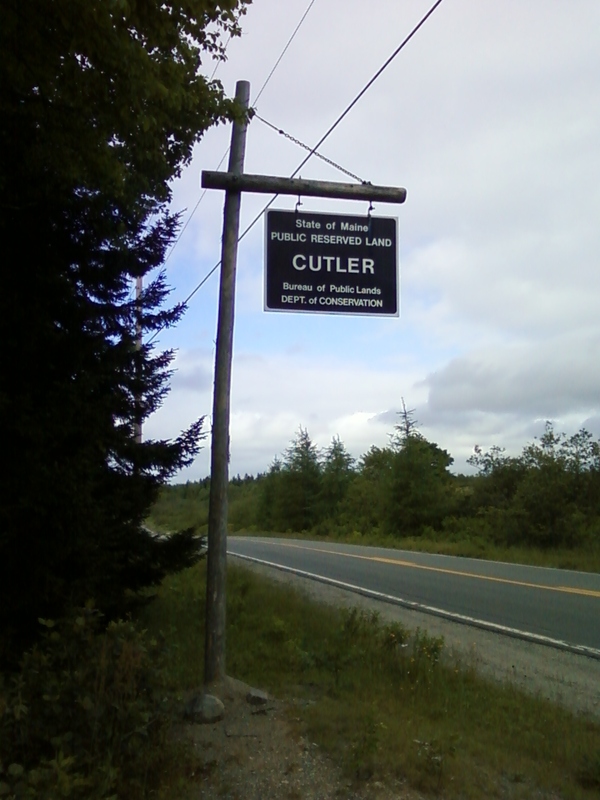 This entry was posted in Hiking, Maine. Bookmark the permalink.